Line a baking tray with non-stick baking paper and set aside. Melt the butter in a large saucepan set over a medium heat. Add the marshmallows and stir with a heatproof rubber spatula until melted. Tip in the Rice Krispies and sprinkles and stir gently until well mixed and evenly coated. Pop on a clean pair of kitchen rubber gloves, as the mixture will be too hot to handle without them, and rub a little sunflower oil on the palm side of your hands and fingers. Working quickly before the mixture sets, shape into 12 even-sized large eggs, arranging them on the lined tray as you go. Set aside for at least 30 minutes, until cooled and set. Now for the decorating bit. Place the white chocolate in a small heatproof bowl. Melt over a pan of simmering water or in 30-second blasts in the microwave, stirring regularly. Once melted and smooth, set aside to cool a little. before returning to the tray. Alternatively, using a teaspoon, drizzle the chocolate back and forth over the eggs on the tray. You could also use a combination of these effects. Scatter sprinkles onto the chocolate before it sets. Pop into the fridge for at least 15 minutes to set. These will keep for a few days layered between parchment paper in an airtight container. 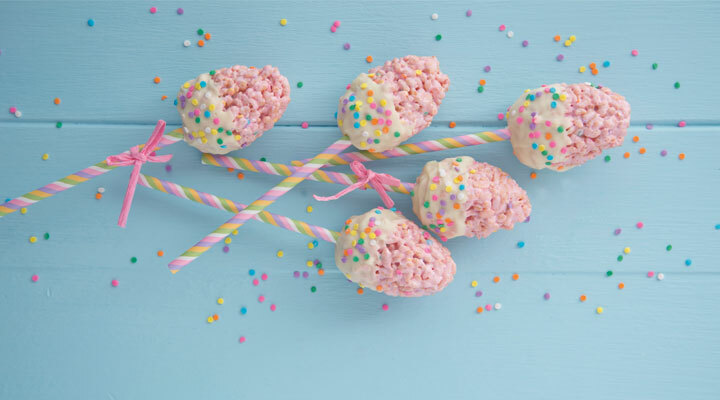 Top Tip: When ready to serve, push a cake pop stick in through the base of each egg to serve as a lollipop if liked. Tie a little ribbon around the stick for added prettiness. Wrap the pop in some cellophane and tie it with ribbon if giving as a gift.